Among the 10 largest Hispanic origin groups,8 all have their largest populations in just three states: California (Mexicans, Salvadorans and Guatemalans), Florida (Cubans, Colombians, Hondurans and Peruvians) or New York (Puerto Ricans, Dominicans and Ecuadorians). The largest single Hispanic origin group population in a state is the Mexican population in California at 11.8 million people. Texas is home to another 8.4 million Mexicans. Together, these two states contain 61% of the total Mexican population in the U.S. Among Cubans, two-thirds (67%) reside in Florida, making it the greatest population by share of any top 10 Hispanic origin group among the 50 states and the District of Colombia. 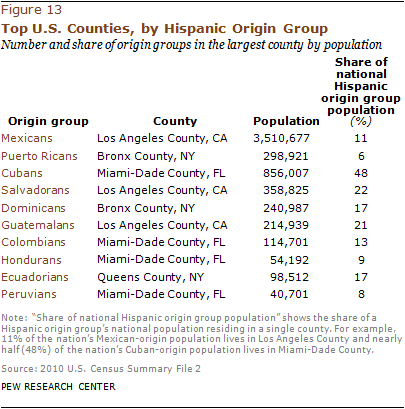 Miami-Dade County, Florida, has the largest populations of Cubans, Colombians, Hondurans and Peruvians of any county. For Cubans, this is particularly notable—nearly half (48%) of the nation’s Cuban population resides in Miami-Dade County. Three of the 10 groups have their largest populations in Los Angeles County, California. This is the most populous county in the country for Mexicans, Salvadorans and Guatemalans. While only 11% of Mexicans residing in the U.S. live in Los Angeles County, more than one-in-five Salvadorans (22%) and Guatemalans (21%) reside there. Bronx County in New York has the largest Puerto Rican and Dominican county populations. Queens County in New York has the largest Ecuadoran population among the nation’s counties.